The “Whatever Veg You’ve Got” Pasta Salad | One Picture, A Million Words. We don’t strictly follow the Meatless Monday movement since we go meatless at least four days a week but tonight’s dinner is truly meatless. No anchovies. No chicken broth. Completely meat free. I call this the “whatever veg you’ve got” pasta salad because it simply is that. What you need to start off with is a gentle sautee of sliced garlic (a couple cloves will do) and a couple tablespoons of olive oil as your flavour base, then what follows can be anything you wish to add to the frying pan to make up your pasta salad. 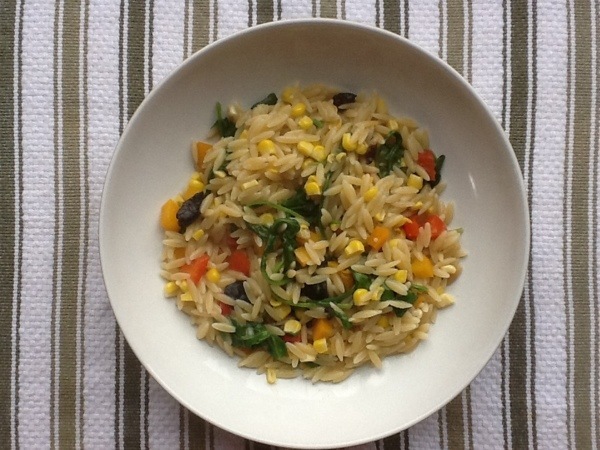 In this instance, I added sweetcorn kernals, diced red and orange bell peppers, pitted black olives and arugula. Any vegetable in any amount will work. But I wouldn’t go for a soft mushy vegetable like an aubergine. My pasta of choice here is the risoni, also known as orzo. I used to like cooking with long cuts of pasta like linguine and spaghetti but ever since my baby son started eating the same dinner as the rest of us, I prefer to use small cuts of pasta (popular choices with him are ditalini, penne and fusilli) that will facilitate either spoon- or self-feeding for him. An easy meal to make the next time you have no idea what to cook for Meatless Monday.